Are you ready for the liquid state? 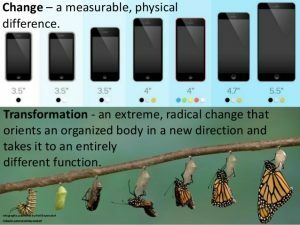 There is a crucial difference between change and transformation. While change is more linear and serves to optimize existing processes or structures, transformation is much more profound and holistic. During a transformation process, as the word implies, the form of an organism per se changes radically, and so does its functionality. This leads to completely new possibilities and results. If we look at the current trends in organizational development towards “new work”, one thing becomes clear very quickly. In order to develop an existing organization, which still works according to the traditional pattern, in this new direction, more than a mere change process is necessary. It needs a profound transformation of the company. The entire organism “company” has to realign and take on a new form. Laws that have been applied so far and processes that have worked so far become irrelevant and must make place for new laws. This concerns not only individual areas, but the entire organism, meaning the entire company. 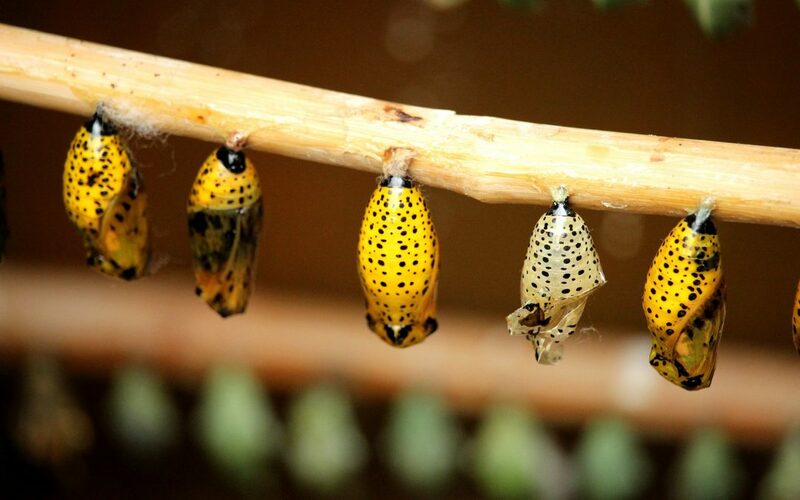 Looking at the example of the transformation of a caterpillar to a butterfly, there is a stage during the process in which what was previously caterpillar completely dissolves and becomes liquid before the cells reform and mutate into a butterfly. In this state, the being is neither a caterpillar nor a butterfly. This temporary liquid state is part and the prerequisite of every transformation. Without liquid state, there is no transformation! The same applies to you as a human being, but also to organizations. Everyone has a so-called box. Your box is made of your experiences, your upbringing, your opinions, your conditioning, etc. It’s the way you see and perceive the world, what you think is possible and what’s not possible. Other words for this are your ego, your personality, your worldview or the mentality. The box also includes your comfort zone, which you know so well. In your box, everything stays the same – nothing new happens here – because your box has the purpose to ensure your survival. And not only people have a box, but also families, organizations, companies, villages, cities, countries, … The box dictates how the organization works, what can be done and what is okay to believe in and what not. Such boxes are pretty hard and inflexible. So if you want to change your box, or if the box of an organization needs to change so that something completely different is possible, a transformation process is needed. And as stated above: without liquid state, there is no transformation! 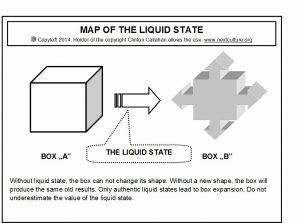 This means that the box, the known form must first go into a liquid state before it can take on a new form. So far so good. The problem is, however, that this liquid state can feel very “unpleasant”. Fear rises up automatically, when the known dissolves and at the same time the new is not yet visible. Uncertainty is spreading, the feeling of danger and the question: “Will we survive?”. It is this fear of the liquid state that usually keeps us from transforming to our next level of evolution (figuratively to the butterfly level). Organizations in the liquid state – how does that work? This process is already difficult for individuals, but in an organization, this effect multiplies. Fear and insecurity are even bigger, since very few people have learned to handle fear and insecurity. Basically, fear is a natural companion in life. Because life means development and evolution. That means that life involves times when we (have to) leave the safe and familiar harbour and (have to) make our way to new shores in order to reach our next level of development. Fear is very natural during these phases. However, fear does not have a good reputation in our society – fear is to avoid at all costs, especially in business. Fear is considered as unprofessional. So we’re trying hard to maintain the status quo, or at least to keep control in times of change, in order to not feel that fear. So, how can an organization take the difficult path through the liquid state to go through the necessary transformation? On the one hand, it is important that all parties are aware that a liquid state is normal and even necessary to achieve new results in the long term. In addition, the consciousness that this state may feel uncomfortable and create fear is necessary. Furthermore, it requires the willingness of all parties involved to go through this liquid state together. The willingness to venture into new territory, even if this means having to give up old and beloved habits. If not all or not the vast majority agree, transformation will be difficult. Just imagine the caterpillar: if too many cells refuse to participate in the transformation, it would never be possible to create a “functioning” butterfly. In addition, it would be very helpful during the transformation process in organizations to have people who are able to consciously navigate through such liquid states – themselves and others. Let’s call them transformation companions or Edgeworkers. People who are used to it or at least do not panic when they are working on the edge of their comfort zone or the comfort zone of the organization in order to break new ground. People who are friends with their fear, and have no problem with temporary uncertainty and discomfort. People who are able to withstand times of uncertainty and not knowing. People who dare to try new things on the way to find out what works and what does not work. And let’s face it: how many people do you know in your organization who have these skills? Especially in the executive floors such Edgeworkers are rather rare to find, because liquid state also means to give up control. And that was never part of the job of leaders in traditional companies. So it may be necessary that you first have to train such Edgeworkers or you get external experienced transformation companions as support. The best would be a combination of both. So before you initiate a necessary transformation process in your organization, first check that everyone is ready for the liquid state.